Howdy, talliers! It's June and we've got some news. A Little Light Crowdfunding, Perhaps? 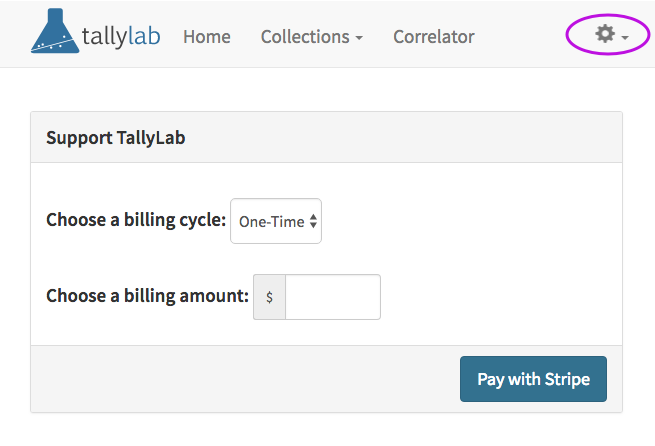 The current "classic" version of TallyLab will always be free to use, but TallyLab isn't free for us to make. If you find the app useful, consider contributing to our efforts via the new billing form in the admin section of the app. External sources of data, starting with weather and Google Sheets. Shared tallies. Maybe you and your roommates need to keep track of whether the cat was fed today, or maybe you want your doctor to have read-only access to your sleep tally. Your data is local to whatever device you're using TallyLab on. That means if you lose that device, you lose your tally data as well. Oh no! On the Settings & Utilities page, click "Download .ZIP"
If you use iCloud to back up your device, you're all set. TallyLab data will transfer to your new device. Unfortunately, all we can suggest here is downloading CSVs from individual tallies for now. New Users, Part 1: What happened to the tour? Some of you who on-boarded recently encountered a bug where the example collection, Social Log, did not install and therefore the tour of that collection did not launch. Bummer! Thanks to Titlecard Music and Sound for providing the backing track!